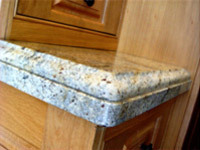 Granite or Quartz will add a luxurious sense of natural elegance and beauty to almost any of our kitchen door styles. In recent years it has become the favoured choice of many clients. 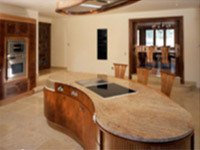 This is probably due to it performing extremely well when compared to other worktop materials, in relation to its heat, stain, impact and scratch resistance. 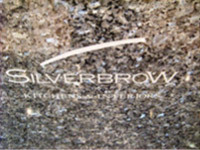 Surface finishes range from Honed (smooth matt), Brushed (textured satin), to Polished (smooth gloss). 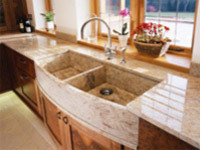 There are plenty of edge details to select from and if you are having an under mounted sink, you may wish to add drainer grooves and/or a recessed drainer, to maximise the practicalities surrounding the sink area. The fairly recent introduction of Quartz worktops has enabled stonemasons to offer a range of plain/neutral colours that particularly compliment contemporary or minimalist design. 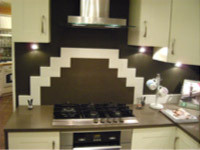 Like granite it can remove the need for wall tiles by the use of upstands and splashbacks. This maximises the overall clean/uncluttered look and removes the issue of tiles dating or the grout becoming a maintenance issue. If you are searching for a timeless look that brings your kitchen worktops to life through natural colours, then solid stone may be the solution for you.